What is the best software for 3D modeling? Originally asked on Quora here. 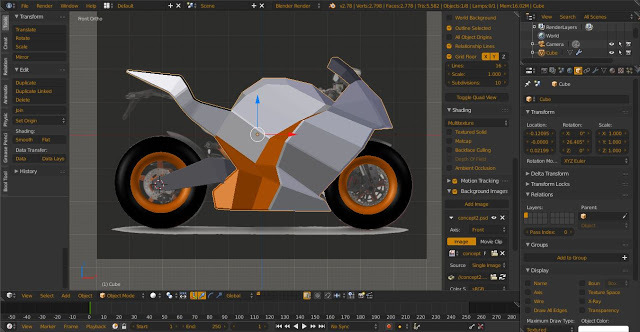 There are two kinds of modelling workflow you need to consider. Forget about what is the best “big brand” or free vs payed.. thats not something that should affect your decision on what kind of modelling you want to do. Of the two methods I’m going to explain..
2 or you may prefer the other which will give you the complexity which is what I think you might be really looking for. You might windup using both at some point, so its best to try both of them(or at least read up on both). In programs like Rhino, Inventor, AutoCAD (and solidworks and others) once can model objects by inputting precise measurements and geometric parameters. You would input the length of the rods, and a few simple parameters for the bends.. all these parameters can be easily translated to the real world.. when you have to get down to actually constructing it.. or give an instruction manual to someone else. However with this method you will be limited by the rules of geometry.. and only very experienced modelers are able to use this method to create something as complex as a fluid form one would sculpt out of clay. (Zbrush and Sculptris use a different workflow but are more compatible with mesh modelling programs than solid modelling ones). You can then modify mesh models in ways that are not available for 3D solids or surfaces. For example you can apply creases, splits, and increasing levels of smoothness. You can drag mesh subobjects (faces, edges, and vertices) to deform the object. Clay like sculpting is achievable and is usually done with Zbrush or Sculptris(free) .. Blender also has a sculpt mode thats fairly good. A wildlife photographer and a product designer sent me this picture of an otter.. They needed me to create a model of it that could be 3d printed and used to create a cast for some teracotta clay statues people can put in their garden ponds/fountains..
Because I used Blender.. I was able to make multiple iterations to the design and get it all done in days. So in a nutshell, think of the kinds of projects you want to be doing.. and then decide on which 3d workflow is best for you. Unlike solid models, mesh models have no mass properties(necessary for running simulations etc..). For 3d printing the model has to be exported to stl or other solid formats(a simple process). Sketchup is a fun maverick.. I’m not sure where i’d put it. Mostly under solid modelling .. though its much easier to use. Want to learn Blender(or some other 3d software)? Heres what you can do.. to maximise efficiency and avoid wasting time.. Depending on your learning speed this could be achieved in anything like a few weeks ..
What kind of cool 3d stuff do you want to model? example if its a spacecraft – do a few sketches or look at other spacecraft designs to get inspired and base your design on. is it a spacecraft from the Star Trek universe or the Battlestar Galactica Universe? is it a cyberpunk or steampunk or retro style craft? is it a realistic craft that someone like NASA might have built? create a folder.. name it “refrence” and save images and sketches of spaceships you like. By now a newer version of Blender might have released.. download and install it. Open blender. Do not model a space craft. Thats like a baby trying to drive a car before learning to walk. But seriously, the problem with making a really ambitious project your first ever 3d project is that when you fail(99% guaranteed) you will be demoralized and give up too soon. Instead go to step 4. Open Blender, model a nut and bolt. feel good and confident, close blender, walk away.. go grab a beer(if you don’t drink, go do whatever you do to reward yourself). Open Blender, model a pipe.. a metal pipe.. fix the nut and bolt onto it.. continue to build a bicycle. feel good and confident, close blender, walk away.. go grab a beer. Open Blender, open your bicycle file. add materials and lighting to the file.. render it. feel good and confident, close blender, walk away.. go grab a beer. repeat this process with cars, trucks.. and then.. feel good and confident, close blender, walk away.. go grab a beer. Please remember to enjoy yourself. In October 2016 I passed this stone.. I proceeded to photograph it and then used a mobile app called flipaclip to animate it.